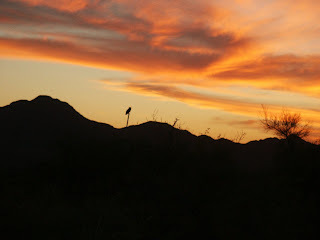 One of the many things that I miss about my little house in the Tubac foothills is the owls. I loved to hear the lonely call of an owl late at night! On one occasion I was lucky enough to get almost within touching distance of a HUGE Great Horned Owl, who took off at the last moment with an enormous and slow whoosh whoosh of his massive wings. What a thrill that was!! You can only recognize him in this picture if you know what you're looking at, but he came back the next evening and perched silouetted on a spire of a big ocotillo. The reason for this post is that I received an article today from blog.rv.net on owls, that I found fascinating, and I wanted to share it, simply because the critters, huge to tiny, are so unique! "As stealthily as my night-time awkwardness would allow, careful not to break a twig or fall in a hole, I followed Ranger Kenny through the inky darkness of the forest, although we were only a few yards away from the campground. I stayed as close as possible—flashlights were forbidden—since lagging just a few feet behind could result in straying off the trail, or crashing into a tree. Kenny moved as quietly as a predator on the hunt. After several minutes my eyes had adjusted enough to the night for me to see Kenny’s signal to stop. He inserted a small card into a small bird caller device and pressed a button. An eerie call emanated out into the darkness. We waited. A minute later, Kenny repeated the call. We waited, staring up at the black silhouettes of treetops against the moon-less sky. Suddenly a dark shape sailed noiselessly like a ghost across the milky way’s path of stars and landed in the forest canopy–and repeated the call. Goosebumps broke out on my skin. 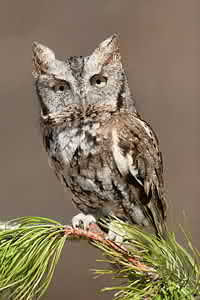 We had actually attracted an Eastern Screech Owl, that now sat right above us. Owl walks, or Owl Prowls as they are called, are a form of bird watching in which the majority of birdwatchers seldom have the chance to participate, since we humans, unlike owls, were created with a short list of useful nighttime attributes. Our very small eyes become nearly useless after the sun sets, limiting us to little more than well-lit activities, like reading, watching television, and staring into campfires. Owls, on the other hand, were designed to function efficiently in virtual darkness. Their large eyes enable them to see even in low light situations, kind of like looking through an infra-red night scope, only without the green tint. Instead of eyeballs like we humans have, an owl’s eyes are elongated tubes. Owls cannot roll or rotate their eyes—their line of sight is straight forward. If an owl is not looking directly at you, then it is not looking at you. It more than makes up for this inadequacy by being able to rotate its head through about 270 degrees and to nearly vertical. Because both eyes are in the front of the head, owls have binocular vision, they can see an object with both eyes at the same time, unlike birds whose eyes are on either side of the head. With this vision, owls see much as we do, perceiving objects in three dimensions and judging size. Owl ears also rack up a lot of points on the predator scale. First of all, those cute little tufts you see standing up on top of some owl’s heads—they are just decorations. The ears are on each side of the head, way back, behind the eyes. In operation, the owl’s flat face (you never saw an owl with a beak, did you?) acts like a receiving dish, which directs sounds to its ears. It can detect even the smallest movements of nighttime feeding rodents and other mammals. And as if that weren’t enough, it can also detect differences in the length of time a sound takes to reach each ear individually, then turn its head slightly until the sound arrives at each ear at exactly the same time. At that point it knows that its soon-to-be-meal is directly in front of it. Taking flight, it aims directly for the sound. If the prey moves, the owl makes the necessary corrections in mid-flight, and at about two feet before reaching its prey, it extends its feet out in front and spreads its talons to form a large oval above the target zone. Not too many unfortunate critters escape at this point. It’s a good thing that owls, already among nature’s most efficient predators, aren’t the size of pterodactyls, or sitting around a campfire at night would bring new meaning to potlucks." Wouldn't it be fun to take part in an Owl Prowl ! !